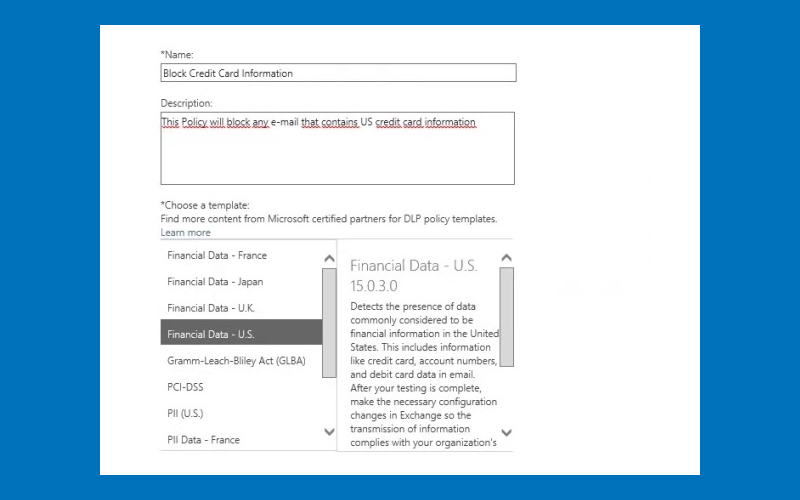 Exchange 2013 provides comprehensive capabilities to help organisations identify, monitor, and protect sensitive information from leaking to third parties.Microsoft provides standardised regional libraries of policies to cope with management of credit card and financial information, personal information, and a variety of other metrics to help organisations comply with data protection laws according to the countries in which users are situated. Office 365 is the only “off the shelf” product acceptable to US Federal Government and EU Covernment purchasing departments, and Microsoft’s DLP provisioning i relied on overwhelmingly by instititions large and small to establish data protection policies with the minimum of additional cost. In Exchange 2013 Micorosoft introduced Document Fingerprinting and Policy Tips in Outlook Web App (OWA) to enhance document control and user education. Document Fingerprinting enables you to match documents that are derived from the same template. This can be useful for organizations that frequently use standard forms or templates, for instance a law firm that uses a standard template to draft patent applications that it files on behalf of its clients. Inform users of the presence of sensitive information and optionally block the email from being sent. Educate your users through a Notify Policy Tip when sensitive content is present in their emails. Empower your users to make case by case decisions by allowing them to override the sensitive information policy—with the option of including a business justification for the override.